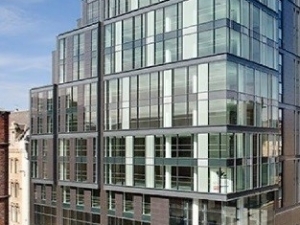 A new iconic nine storey office development in the heart of Glasgow’s business district providing high quality, modern, open plan office accommodation. Full M&E services fit-out including LG7 compliant lighting, heating, ventilation, cooling and three passenger lifts. An underfloor service distribution strategy of power/data floor boxes combined with floor mounted air conditioning units provided a flexible design solution, substantially reducing the space requirements typically needed for traditional ceiling void mounted services.